I set up this forum as a place to store all important information about V-Stroms. For example, you can post links to bike reviews, copies of tech bullitens, excellent posts that merit a permanent place, etc. Polls on members and their bikes have become the main use of this forum. Subject lines should be obvious as to what the thread contains. 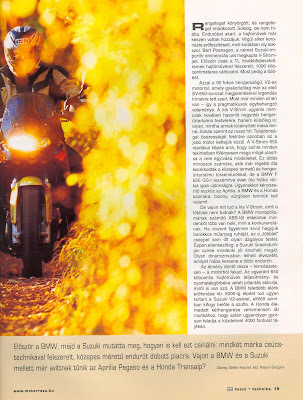 For example if you want to link a bike review from Motorcycle News of the 2007 DL-650, make your subject RIDE REVIEW MCN 2007 DL-650. It is important that we make this thread a good resource. I've posted every Strom related test from my site that I've found in the last 2 years! And it nearly killed me.....but I hate to see an empty forum. If any new Strom ones appear (I check weekly) then I'll add them in here as well. I am wondering if it makes sense to post reviews on other languages than english? I think something may have happened in the conversion to the new software -- there used to be a ton of review listings and now they're gone. . . Thought you might want to know. You are right. this also occured in the Stromtrooper Giveaways section. Will investigate. All the threads are still there! It's just that the default thread viewing is set to 30 days in the Admin CP....change it to "from the beginning" and everybody will see all the threads. Okay, I just got it! The "Display Options" box at the bottom of the page has the option of "display all threads from the beginning." A simple click, and voila! All the posts return to their rightful place. I kept waiting for the "Admin" to change something in the Admin CP, so I looked further, and there it was. Thanks, Pete, for the tip! For everybody's convenience it really needs an Admin to make the change in the Admin CP so the whole board gets opened up as soon as you view a section. Until somebody does that, all members will have to manually set their preferences. 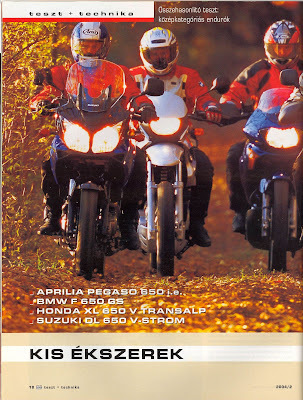 Comparison test of Pegaso 650 ie, BMW F 650 GS, XL 650 V Transalp, DL 650 V-Strom in Hungarian language. Click on the pic for the full review.